Nearly three years ago, my family made a cross-continent move from a short ministry stint in Vancouver, BC, Canada to North Carolina. We arrived to our new home with six suitcases, a jogging stroller, a pack ‘n play and a diaper bag. Our new townhouse fit our family perfectly–but we didn’t have much to fit inside it. Since we were transitioning from a tight missionary budget to an even tighter one-income teacher salary, we knew our choices on furniture would be limited. It was either Walmart (if we could even swing that) or second-hand. The more we thought about purchasing our items second-hand, the more excited we became. Our few months in Vancouver had taught us much about green living. We had never recycled before, yet we were required to there. And why not be resourceful and reduce some waste by reusing someone else’s old furniture? It would be “new” to us, regardless! Having purchased many baby items on Craigslist after the birth of our first child, we quickly turned to the popular online classifieds site. Out of the furniture we had in storage, the only item we purchased ourselves was the recliner–and we had bought it used from our brother-in-law for around $60. Altogether, we spent around $500 to finish furnishing our entire 1,600 square foot house (which we also found on Craigslist)! We have since purchased some more children’s furniture at a consignment sale. And my favorite “re-used” item at our home is still the $500 playhouse I snagged for free at the local dump when I was dropping off my recycling. If you’re moving, downsizing or just wanting to be more green in your home purchases, it’s completely possible for you to utilize Craigslist this way, too! Envision the furniture you desire and make a list. Start checking your local Craigslist daily for the items on your list. When you see an item you want, e-mail or call the seller and ask if the price if “firm.” Do not be afraid to negotiate! I only had one person get angry when I offered a lower price. We never paid asking price for any of our items! Eye before you buy. Do not commit to any purchases over the phone or via e-mail. Ask when you can come see the items. Just go quickly, as most Craigslist sellers do not wait if they get a better offer! Take your spouse or a friend with you when you eye/buy the items. This is very important. Sadly, there are Craigslist scammers out there, and people have gotten themselves into some pretty dangerous situations. Meet in a public place, or take several people with you if going to the seller’s home. If you have a bad feeling about it, don’t go. If you see another item that you like at the seller’s home, ask if it’s for sale! We snagged the cabinet-turned-changing table at the house where we went to buy a bookshelf! Use your creativity to make the items your own. We stained the pine bookshelves to match the rest of our darker living room furniture, and we painted both the “changing table” and children’s bookshelf black, to match our black crib. 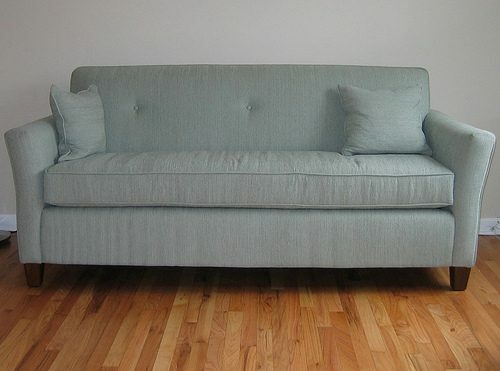 Have you ever bought furniture on Craigslist? What other green ways have you furnished your home? Erin is a Jesus-loving, cloth diapering, natural birthing, (mostly) real-food eating, breastfeeding natural wife and mama to two little redheaded girls (with a 3rd on the way!). She writes for her local newspaper, blogs about her far-from-perfect homemaking at The Humbled Homemaker and edits eBooks at Your eBook Resource. I have bought and acquired furniture for free on Craigslist probably a dozen times over the last year with great success. It is amazing sometimes what good things will be given away just because people want it gone quick. My family is planning a move next year, and I have suggested to my spouse that it will be cheaper to replace most of the household furniture using Craigslist, than to pay to move it half way across the country. Very good points! I love CL for furniture and household goods. -Look for grammar and spelling. These are a good sign. -look for multiple pictures that are pretty clear. If there are no photos I usually move on. -look at other things in the picture around the item(s) to get an idea of what color/size it is. -is there information about why they are selling/giving away the item? -If anything about the way the ad is worded makes you feel weird or uncomfortable don’t reply to that ad. Your safety is worth more than the best deal.